Mathilda Gyllenhaal hosted cultural salons during the 19th century at which artists, poets, and musicians met and exchanged ideas. She also wrote poetry herself and created and played music. She composed music set to texts by several prominent Swedish poets. Mathilda Gyllenhaal grew up in Florence. Her mother was from Austria and her father was Spanish. When she was 17 years old she was married off to an Italian nobleman called Bartolomeo Cenami. He was 20 years her senior and was Elisa Bonaparte’s Grand Equerry. Mathilda Gyllenhaal was widowed just two years later. During a study trip to Italy in 1811 she met Josias Montgomery-Cederhielm, a Swedish colonel. He praised her singing in a travelogue and it was not long before he asked her to marry him. Following a period of corresponding the couple then married and settled at the Segersjö estate near Örebro. Mathilda Gyllenhaal learned Swedish quickly and became a much-loved hostess. She held large parties, often including tableaux vivants where the guests portrayed various legends or famous artworks. However, she found life in the country dull and the couple rented an apartment in Stockholm. Here Mathilda Gyllenhaal created a salon culture for city’s high-society and it was patronised by the most eminent members of literary, artistic, and political life at the time. The guests were entertained by conversation, singing, and music. Mathilda Gyllenhaal had a beautiful alto voice and was a talented harpist and pianist. According to the musicologist Tobias Norlind she was also an accomplished composer. Her compositions, which comprised advanced cadences, often in the style of an Italian aria, bore influences of her extensive knowledge of coloratura singing. She composed several solo songs and instrumental pieces, such as chamber music and a cavalry march for her husband’s regiment. She also socialised at the Swedish court and the Crown Prince Oscar asked her to compose a tattoo and reveille for the army. At the beginning of the 1820s the family purchased the Stora Frösunda estate in Solna where they spent the winter months. 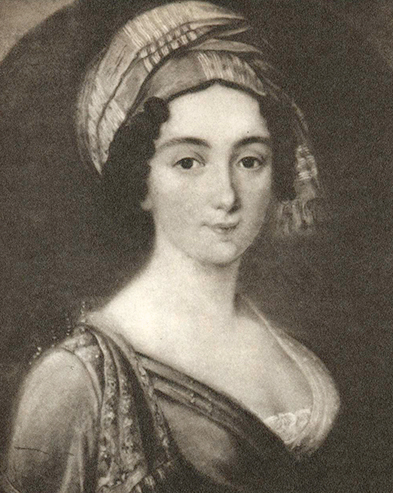 Mathilda Gyllenhaal continued to hold her salons and during this time her social life expanded further, even after the death of her husband in 1825. She continued living at Stora Frösunda with her four children. Some of her acquaintances included the Uggla, Beskow, Åkerhielm, and Kraemer families as well as literary figures including C.V. Böttiger and  (Fredrika Bremer). Mathilda Gyllenhaal also met Esaias Tegnér during this time. In order to socialise with Mathilda Gyllenhaal he spent several periods living at Stora Frösunda. She would improvise on his poems and several of the resulting songs, including Axels monolog, were published. This became a productive period for Mathilda Gyllenhaal. One of her pieces published in 1829 was her Fyra sånger, dedicated to the memory of Charlotte Åkerhielm, and in 1833 five of her songs dedicated to the governor  (Lotten von Kraemer) in Uppsala were published. This included the song entitled Afskedsönskan with lyrics composed by C.V. Böttiger. The following year three of her songs dedicated to the writer  (Fredrika Bremer) were published. These songs were composed for and performed in private salons but once published they were disseminated beyond her immediate circle of friends. In 1839 Mathilda Gyllenhaal married Carl Alexander Gyllenhaal, a cavalry captain, chamberlain, and later baron, who was 18 years her junior. The couple settled at his Ölanda estate near Skara in Västergötland. Although the move entailed a change to their social life music continued to play an important role. Mathilda Gyllenhaal now began to compose a lot of dance music and waltzes which she would perform at parties. Life at Ölanda was dominated by the military, and this was reflected in the texts she set to music such as the songs Champagne-ruset, Sveriges främsta ädling, Hambo-Polska, and Galoppen. Mathilda Gyllenhaal’s songs were often connected to the Gustavian-era singalong songs, based on strophes, usually in 8 or 12 metre bars with simple piano accompaniment. It is probable that she added more improvised coloraturas during her performances than those which were noted down. Her earliest songs mainly comprised music for Tegnér’s, Beskow’s, and Böttiger’s poems, but after 1839 Mathilda Gyllenhaal sourced her texts from a wider range of sources and sometimes even penned her own. Her published music collections were often dedicated to her friends, with phrases like “till fröken Maria von Stedingk”, “till H Ex Hr Grefve M Brahe”, “Till HKH Hertigen af Upland” (Prince Gustaf), and “Till HKH Hertigen af Östergötland” (Crown Prince Oscar, later King Oscar II). Mathilda Gyllenhaal moved to Stora Ekeby ten years later where she continued to socialise with the upper echelons of society and making music, but also began to garden and engage in charitable activities. These included supporting the abstinence movement and establishing schools for poor girls on Ölanda and Stora Ekeby. As her husband tended to spend time in Stockholm during her final years she spent longer spells alone. She published a collection of songs and aphorisms entitled Vid julbrasan för några år sedan anonymously in 1854, in which she reflected on relationships, the discomfort of aging, and on the Swedish climate. Mathilda Gyllenhaal died at Stora Ekeby in 1863. The Stockholm papers only printed the briefest of notices regarding her passing. She was buried at Rytter church according to Catholic rites. She lies in the Montgomery-Cederhielm family grave at Lännäs cemetery. Mathilda Beatrix Valeriana Maria della Trinita Gyllenhaal, www.skbl.se/sv/artikel/MathildaBeatrixValerianaMariadellaTrinitaGyllenhaal, Svenskt kvinnobiografiskt lexikon (article by Karin Wiberg), retrieved 2019-04-20.